“What’s the problem?”, my friend asked me. Evidently my expression revealed the pressure of my wrestling with some unusually delicate situations. The question made me stop to assess what my problem really might be…was it my hesitancy to exercise my faith and commit funds we really didn’t have? Was it in the way I may have dealt with someone recently? Or was it doubting my call? No, if there really was a problem, it was seeing myself as God sees me. Of course, He expects me to be a wise steward in expending the funds. Always, I must be sensitive to the needs of people. Without doubt, my personal call had been settled years ago and still stands today. Then it came to me…my problems are not my problems at all! They are God’s problems! He placed me in position to match His problems with His solutions! He allows me to see the needs, then trusts me to find the solution. What an opportunity …match the open door with His great resources. It may come quickly or be delayed. But, here I am, placed in a position to be a match maker! I wish I could portray to you the needs found out in Indian land. They can literally overwhelm one’s imagination. But this realization has eased the strain and calmed the frustration—just to think that First Nation Ministries can be a match maker. Deliverance from alcohol, drugs, satanic power, yes, all sin, can be found when matched by His blood! Many are literally ‘crying out’ for our help. We need you now more than ever! Can we count on you to join the ‘team’ in taking the Gospel to these who sit in such spiritual darkness right here in our backyard? Truly together we can help them ‘live now and forever’! Rest, if you must – but never quit. Joseph was a stranger in the vile land of Egypt, BUT God wanted him there to save his people. Esther was a queen in a land that hated Jews, BUT God wanted her there to save her people. Daniel was jailed in a den of vicious lions, BUT God wanted him there for a testimony. Jonah groaned in a watery grave inside a great fish, BUT God wanted him there to learn a lesson. Paul and Silas lay in prison, BUT God wanted them there to lead a soul to Christ. Peter too lay in prison, BUT God wanted him there to show his power in answering prayer. John was isolated on a lonely island, BUT God wanted him there to write Christ’s revelation. Why does God have you where you are at this moment? Don Cline, Leon Hansen, and Bob King once again enjoyed a safe and pleasant trip to the Flathead Reservation at Ravalli, MT. We thank God for the big Dodge Diesel and the Wells Cargo trailer. What fine equipment! There is plenty of power for the three and four ton loads we often transport. The trailer has torsion-bar suspension and the latest electric braking system on the market. It is unbelievably easy to use even under these severe conditions. Bro. Lee Wraith joyfully shared the blessing of God’s hand on this Rocky Mt. MissionarySociety chapel and the people at Ravalli. It brightened our day to have Chris Knows-His-Gun, from NIBS, ride along with us. His help in unloading the heavy items was most appreciated. After prayer, thanks, and good-bye, we hurried on north a few miles to Sister Bernie Lovell’s Flathead Reservation Gospel Outreach at St. Ignatius, MT. What a joy to be privileged to have a part in this dear lady’s ministry! 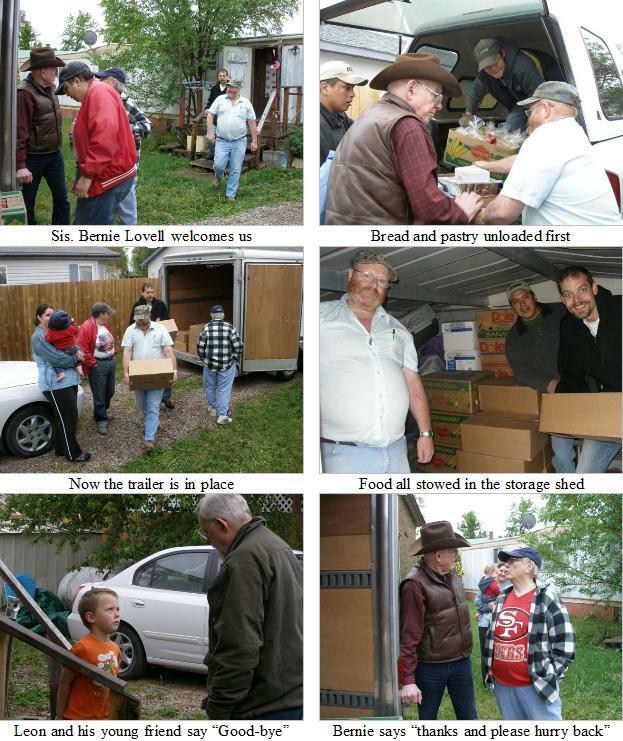 Bernie Lovell is truly God’s handmaiden and is always well organized to handle the work of receiving and distributing the food, clothing, household items and Bibles we bring. Her people are a happy, well-ordered, and directed group. How thankful we are for the courage and determination we find at St. Ignatius after others had given up or couldn’t see the great value of showing God’s love by meeting the temporal needs in order to open hearts to receive help for spiritual needs. We are told that Arizona has 21 Indian reservations and these Indians are truly needy. 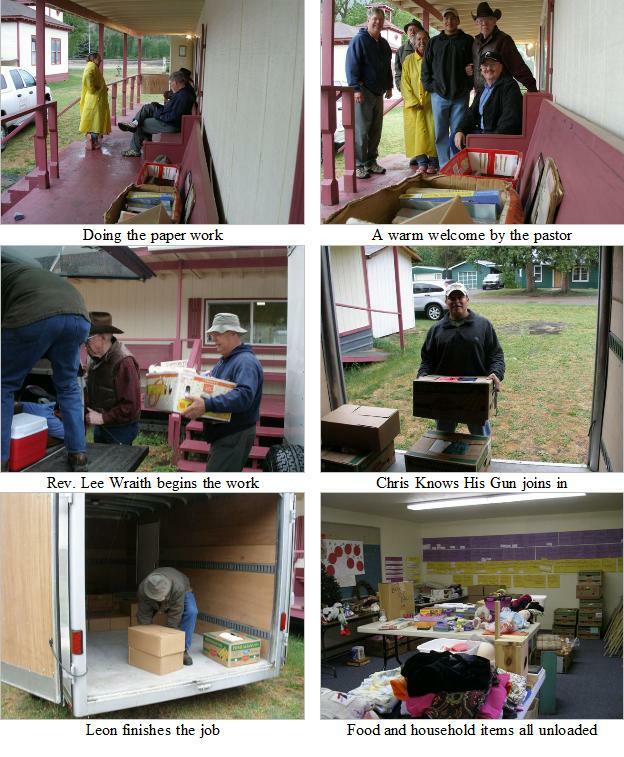 In past years we have helped a number of them with food, clothing, household items, and vehicles. It brought great joy to my heart to once again go where we can be such a blessing. 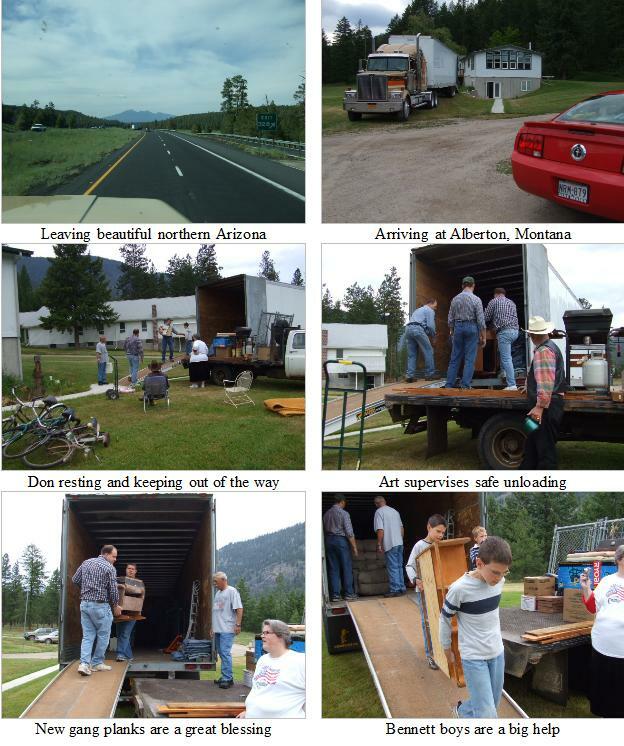 We were able to get a semi-load together by the generous support of our teammates! Ken Sullivan was to join Marv Boettcher to do the driving, but at the last minute, Ken’s wife suffered a heart attack and when Marv went to renew his health card, he found he had a problem that temporarily kept him from driving big rig. But God had His man Art Haddock, waiting “to stand in the gap and make up the hedge”. 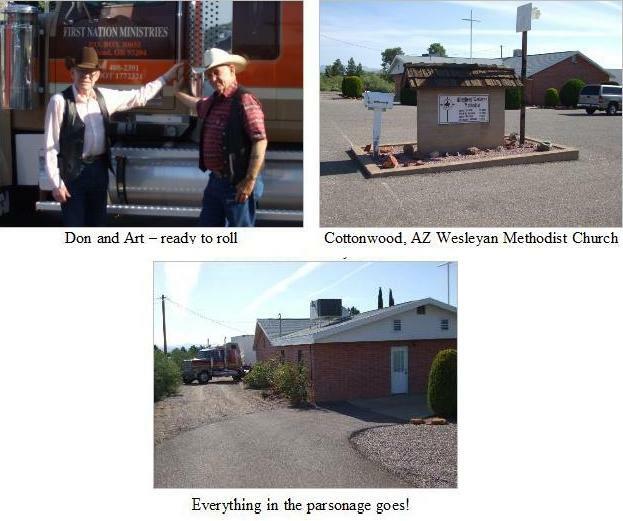 I rode ‘shotgun’ as he skillfully drove to Leupp, AZ and then moved Pastor Dave Price from Cottonwood to Northwest Indian Bible School to pastor the church all in 7 days. It is always a joy when we can haul mission loads “coming and going” and not run with an empty trailer. What a blessing on this long journey to Arizona to give this much needed help both in Arizona and then this load on the return to Northwest Indian Bible School at Alberton, Montana. Rev. Dave Price has been used of God in a wonderful way ministering to the Indian people. Let us all pray for this good brother and his wife as they again minister to Alberton Wesleyan Methodist Church and Northwest Indian Bible School.